The Faculty of Mathematics offers a Master of Mathematics for Teachers (MMT) through the CEMC. The MMT is designed to provide current teachers of mathematics with the opportunity to expand their knowledge base. In addition to providing a deeper understanding of mathematical foundations relating to core secondary school curricula, students will also be exposed to areas of applications of modern mathematics. 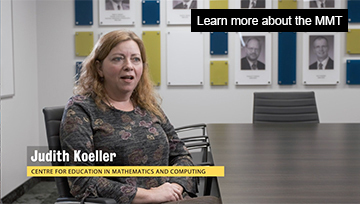 The primary focus of the program is on mathematics and its applications rather than on pedagogy, but it will also challenge its students to look for new and innovative ways in which they can bring their newfound knowledge into the classroom. Some of the material and tasks in each course will be directly applicable to daily classroom teaching, while much of it will not be as directly applicable. The primary goal of the courses in the program is the deeper understanding of the mathematics underlying the content taught in the classroom. It is expected that most participants will be teaching at the secondary school or college level and have been away from formal education for several years at the time of enrollment. The MMT is a professional program offered on a part-time basis. It consists of 9 one-semester online courses including a project-based capstone course. The program is typically completed in 3 years, although it can be completed more quickly or more slowly. A list of currently approved courses is available. We tentatively anticipate offering these courses over the next several years. Information on admission criteria, how to apply and required documents is available. For the online application process, refer to the website for Graduate Studies and Postdoctoral Affairs. Will exceptions ever be made to the formal admission requirements? What is tuition? How much time will a course and the program typically require? Please see our frequently asked questions and answers. For more information, contact the MMT.